The collective term “Asian American” comprises more than twenty distinct nationalities and ethnic groups, and today there are more than 12 million Asian Pacific Americans living in the United States. 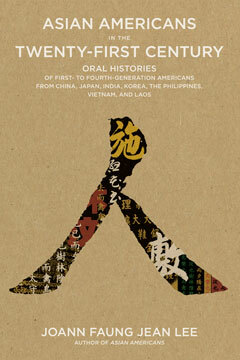 In this all-new collection of fascinating interviews with students, lawyers, engineers, politicians, stay-at-home moms, and activists, Joann Faung Jean Lee again draws upon her great skill and sensitivity as a journalist to reveal a rich mosaic of Asian American identities. We hear a range of voices: Dale Minami recounts his historic involvement in a landmark legal case that changed the way America understands the internment of Japanese Americans during World War II; Ruby Chow remembers how she used her position as a beloved restaurateur to launch a successful campaign for county councilwoman in Seattle, Washington; and Daniel Jung speaks of the complexities of African American and Korean relations in Los Angeles, where his father owned a liquor store when Daniel was a teenager in the 1990s. Candid and compelling, the interviews reveal intimate and often conflicting thoughts about Asian American identities, immigration, family, relationships, and educational and professional achievement.